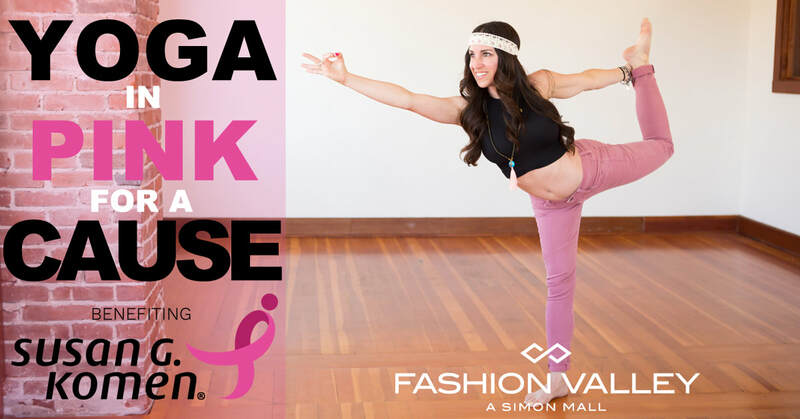 Fashion Valley Mall has Partnered with Yoga Instructor Jennifer Butler from YogaFitsMe.com in hosting a Donation Based Yoga Class on Saturday May 12th at 9am with ALL proceeds benefiting Susan G Komen Foundation. Registered Participants who make a donation will receive a Fashion Valley branded tote bag and/or water bottle plus a Savings Pass Booklet with exclusive offers from select retailers. Jennifer Butler is a Yoga Instructor, Yoga Therapist and Health Coach who focuses on the principle concept “Art of Living Yoga”; living whole and complete in mind, body and spirit. Do Yoga with Jennifer anytime, anywhere via the Yoga Fits Me’s YouTube channel. Connect with Jennifer on YogaFitsMe.com and follow Yoga Fits Me on Facebook, Twitter and Instagram.